The “Via Francigena” in Tuscia is the long road from Canterbury, England to Rome that the archbishop Sigeric of Canterbury travelled – mainly on foot – to visit Pope John XV in 990 AD. On the way back, he took careful notes on his travels and on the stops he made, leaving us with an itinerary that never fails to inspire wanderlust, even today. He walked 2,000 km over 79 days, averaging 20 km a day. The stretch that runs through Tuscia passes through such picturesque villages as Sutri, Capranica, Montefiascone, Bolsena and of course Viterbo. Now that the world has rediscovered the Santiago pilgrimage route in Spain, the “Via Francigena” is also gaining attention, offering a very special spiritual and cultural experience, much of it set deep in Italy’s beautiful natural landscape. 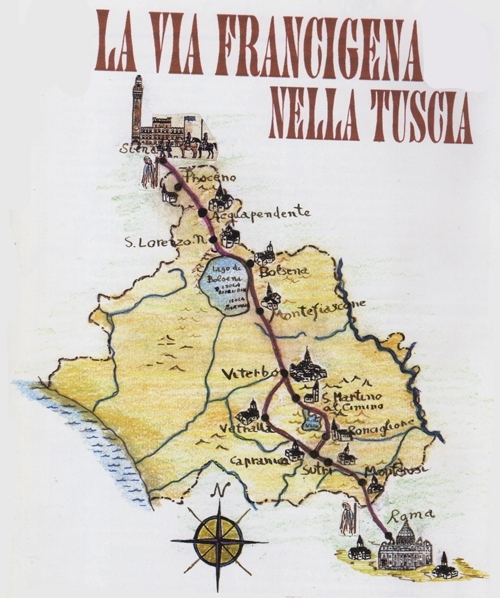 The “Via Francigena” in Tuscia is the long road from Canterbury, England to Rome that the archbishop Sigeric of Canterbury travelled – mainly on foot – to visit Pope John XV in 990 AD..